So today I heard more about the growing number of people who reply to surveys about religious affiliation as “none”. The CBC radio show Tapestry investigated this on the show this afternoon. In the US about 30% of younger people use this description, while in Canada that number is more like 25%. However, for the whole population the number is about the same for both countries at 20%. And there is a new name for some in this category, SBNR’s. Now I am no longer young (being older than 29) but I like that reference, “spiritual but not religious”. I do not fit that group totally, however. I am SBNR, but my spiritual life is emphatically, unreservedly and unashamedly based upon Jesus Christ, Messiah, Saviour. I do not follow any amalgam of religious ideas other than the Bible. So yoga, Eastern religions, whatever, do not form equal ingredients in a spiritual soup or stew that has no roots in anything other than a human spiritual shopping cart. I do not pledge loyalty to any denomination above my loyalty to Jesus, so in that way I am not religious. I am officially a part of the United Church of Canada, but I have also served as an Anglican and briefly as a Presbyterian (though I am ashamed to admit that because after I left my preaching and teaching were dismissed and replaced with a personality cult that taught things contrary to Holy Scriptures). For the last couple of years I have been part of a house church that functions without leadership by any one person, in the best sense of what the United Church founders searched to create structurally, a conciliar system (run by committee/council). Anyway, the whole point of this reveals that traditions, rituals, organized religion and human politics, exposed for the shallow thing they are, turn thinking people off nowadays. One alternative is a priest-less house church. Another rests with those rare congregations that still believe they serve Jesus and reach out to make disciples rather than members. Still another finds people flying solo, something I cannot support as spiritually healthy. 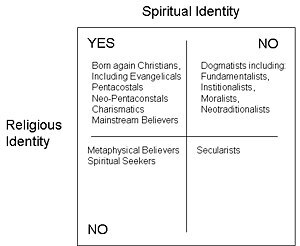 So if you are SBNR that’s okay with me, but know that spirituality is a community project. Find people who live for Jesus like you and encourage each other and grow each other. After all, if you are only accountable to yourself you definitely cannot apply the descriptor “spiritual” in the same breath as claiming Jesus as Lord and Leader and Boss and God, because that makes us servants or employees or disciples or students. May The Spirit be with you. Yes, and sometimes, caught up in and with a group, our eyes and heart tilt down a little and we lose sight of that. May your group help to disciple you into a “good and faithful servant” of Jesus. I love the way you do your Christian walk. My first, and only, allegiance is to Jesus. Although I go the a (non-denominational) church He’s the one who saved me, not the church.